The top two players from each group will progress to the last-16 knockout stage, as we take a look at which players needs which results to seal their passage through, along with fixtures and tables below. Jonny Clayton - needs two legs to qualify. 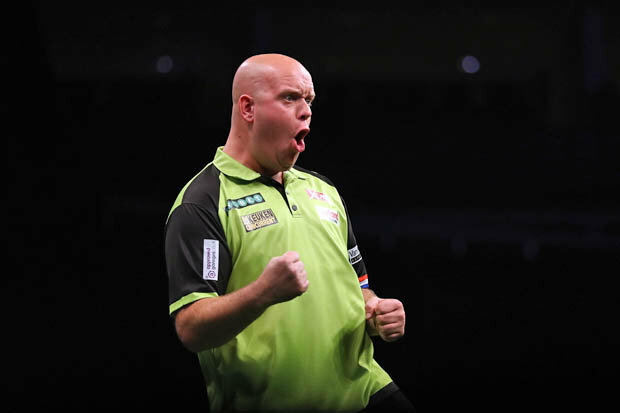 Michael van Gerwen - qualifies with a win. Gary Robson - qualifies with a 5-1 or 5-0 win (ahead of Clayton), or if Van Gerwen loses he would qualify with any win. Joe Murnan - has to win 5-1 or 5-0 to move above Van Gerwen and hope that Robson loses. Michael Smith - qualifies with a win. Krzysztof Ratajski - qualifies with a win, and could still qualify with a 5-4 defeat if Smith defeats Van Barneveld. Raymond van Barneveld - position depends on the result of the earlier game. Adam Smith-Neale - has to win 5-2 or better to move above Ratajski, and then hope that Smith defeats Van Barneveld. James Wade - has qualified. Keegan Brown - qualifies with a win. Wesley Harms - qualifies with a win. Mark Webster - has been eliminated. Gary Anderson - has qualified. Ian White - qualifies with a win. Michael Unterbuchner - qualifies with a win. Steve Hine - has been eliminated.